A 9- month-old boy presented to the emergency room with excessive crying and rectal bleeding. 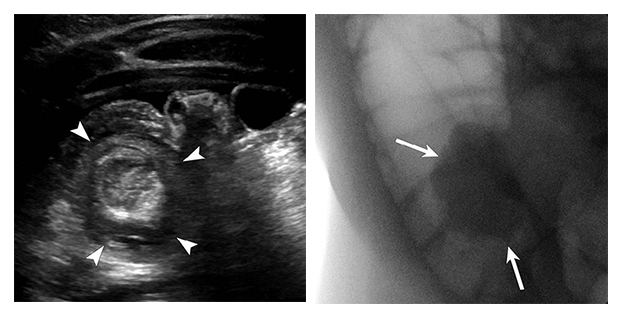 A right upper quadrant ultrasound was performed (A), showing the classic “donut/target” like appearance of the bowel (arrowheads), consistent with intussusception. A fluoroscopic spot image from a subsequently performed therapeutic air enema (B) outlines a lobulated “mass” in the ileocecal region (marked by arrows), which signifies a partially reduced, small residual intussusception. Ileocolic intussusception is one of the most common causes of an acute abdomen between 5 and 24 months of age. Prompt diagnosis and treatment helps prevent obstruction, bowel ischemia, and perforation. The classic clinical triad of abdominal pain, palpable abdominal mass, and red currant-jelly stool is uncommon. Typically, the presentation is more nonspecific. On a three-view abdominal series (supine, prone, and lateral decubitus), ascending colonic air on all views has a reported sensitivity of 100% to exclude intussusception. Ultrasound is now the modality of choice due to its lack of ionizing radiation, quick examination time, and no requirement for contrast media. A “donut,” “pseudokidney,” or “target” sign on ultrasound is used to diagnose intussusception. Intralesional lymph nodes and large lesion diameter suggest ileocolic intussusception. Air/contrast enemas can be performed to reduce intussusceptions. Rectally introduced air outlines a lobulated mass within the large bowel, proximal to which there is very little gas within the large bowel. The “intussusceptum” progresses towards the cecum; free reflux of air into the terminal ileum indicates successful reduction. Air reduction should be performed with immediate surgical support available. Chaturvedi A. At the Viewbox: Ileocolic Intussusception. J Am Osteopath Coll Radiol. 2014;3(4):34. Dr. Chaturvedi works with the Department of Radiology, University of Rochester Medical Center, Rochester, NY.